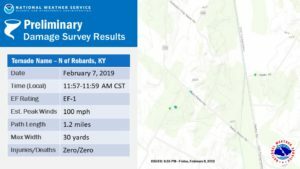 The National Weather Service confirmed two separate EF-1 Tornadoes that touched down in the Tri-State on Thursday. 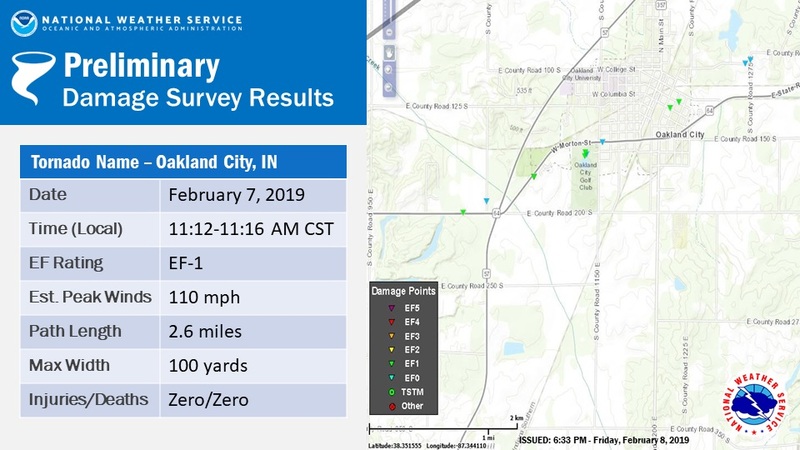 The first passed through Oakland City, IN in Gibson County where trees were toppled, power lines were downed and multiple structures were damaged. 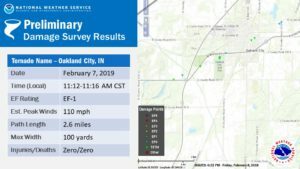 Winds with the Oakland City tornado were estimated to be as strong as 110 MPH. 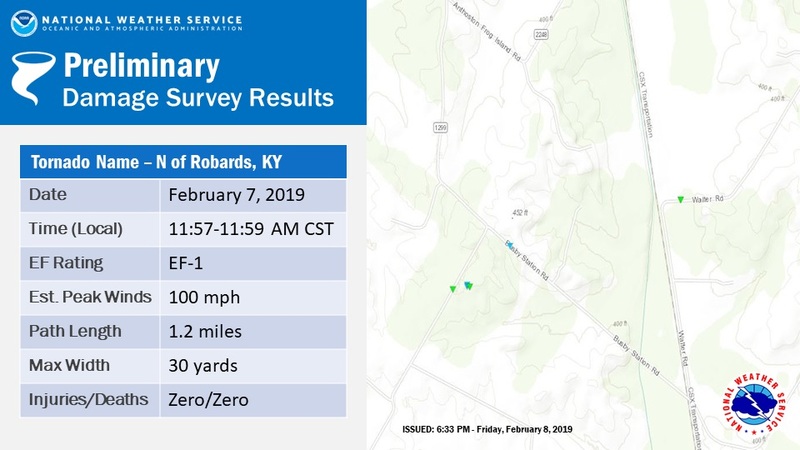 The second tornado was confirmed to have touched down north of Robards, KY in Henderson County. While this twister wasn’t as long-lived or strong as the Oakland City tornado, it still packed a punch. Estimated wind speeds of 100 MPH damaged structures and snapped a tree trunk in half. In addition to the two confirmed EF-1 tornadoes, the National Weather Service also confirmed an EF-0 tornado touched down in Know County, generating winds stronger than 75 MPH .Since yesterday afternoon however, things have certainly calmed down across the region. In fact, the same passing front responsible for for yesterday’s line of storms, supplied the Tri-State with our most recent blast of arctic air. 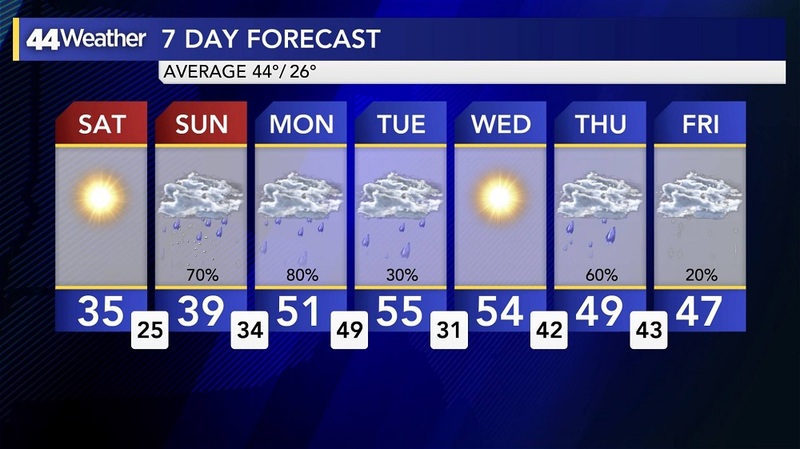 After seeing temperatures fall nearly 50° in 20 hours, we only saw an afternoon high of 28° in Evansville on Friday – we’re expected to see the mercury fall even further overnight. 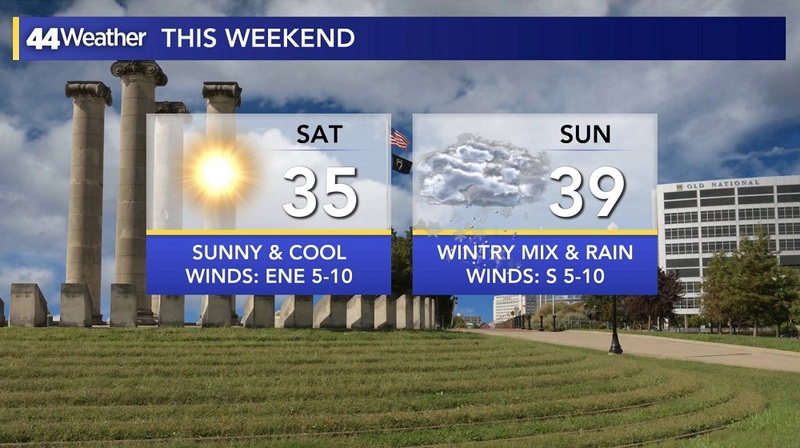 Wind chill values could dip to or below 0° at times early Saturday before we see temperatures climb nearly 10° higher than this afternoon; expect a high temperature of 35° on Saturday. 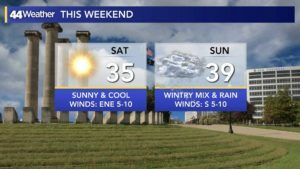 Sunday appears even warmer, though freezing rain, wintry mixture and scattered rainfall is expected throughout much of that day. 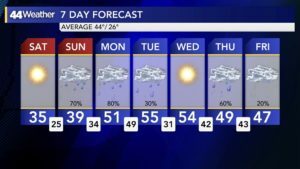 That next dose of rainfall will continue on through Monday and into our Tuesday; some spots could see an additional 1″ to 3″ of total rainfall. The added precipitation is expected to exacerbate flooding concerns across the Tri-State during the ensuing days. At least our temperatures won’t be quite as frigid.